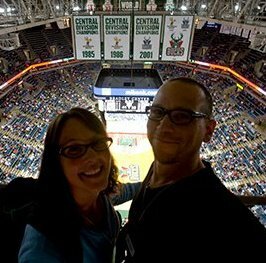 With the roof of the Bradley Center coming day today I got to thinking of my top 4 favorite Bradley Center events! 1. Going on location with Maxine to photograph the new scoreboard and talking the security guard into letting us walk around on the catwalk unsupervised. Copyright © 2014 Milwaukee Photographer Corey Hengen.